At Marine Dental, you and your family will find all the dental care you need at one location, from braces to dentures, orthodontics to implants, and crowns to cosmetic dentistry. Marine Dental is your friendly, full service family dental office. When you visit our office, your smile is our top priority. Our entire team is dedicated to providing you with the personalized, gentle care that you deserve. We are a multi-Doctor specialty practice, where all your specialty dentistry is completed under one roof. Our team consists of General and Cosmetic Dentists, an Endodontist, Oral Surgeon, Orthodontist, and Periodontist. 15% discount to our retired military veterans and our senior citizens. 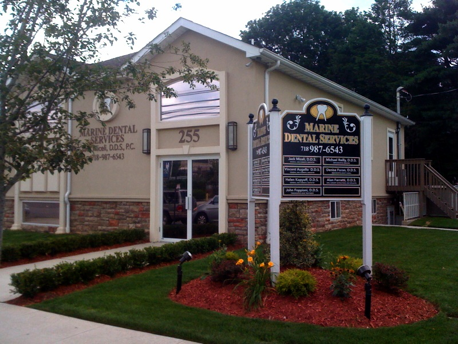 Our Staten Island dentists at Marine Dental Services are dental professionals dedicated to comprehensive dentistry with services including Orthodontics, Periodontics, Sleep Apnea treatment, Cosmetic Dentistry, and more. Please call our dentists in Staten Island, NY to schedule your next appointment.